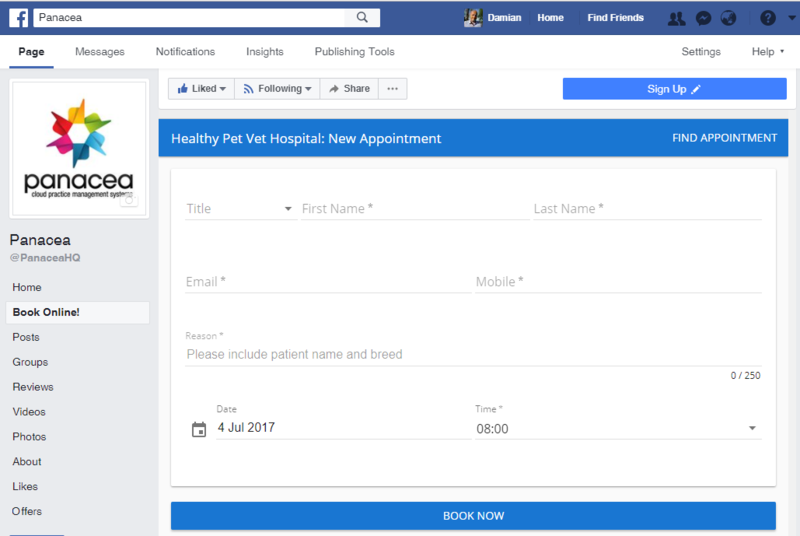 Cloud-based Panacea vet practice management system first in the world to allow vet customers to accept real-time bookings via their clinic’s web site and Facebook page. Offers free data migrations from industry leading platforms. AUCKLAND, 5 July 2017 – Panacea, a provider of cloud practice management systems for small and large animal veterinarians, today announced a world-first, allowing users of the Panacea practice management system to accept real-time online bookings via their clinic’s web site and Facebook page. This functionality is available now to all Panacea customers and is already being used by vet practices in several countries. To celebrate the launch of this market-leading technology, Panacea is offering free data migrations (normally USD$999 per clinic) for vets using any Henry Schein/Provet or IDEXX practice management system. Clients increasingly expect to book and manage their appointments online, without having to pick up the phone, yet less than 5% of vets surveyed provide real-time online appointment booking options. Over 40% of phone calls to vets surveyed go unanswered, typically as a result of staff being too busy to attend customer calls. This negatively impacts upon customer satisfaction and clinic revenue. Over 50% of vet clients surveyed indicated that they would book more appointments with their vet if it was more convenient to do so. Clients cited difficulties in booking appointments and waiting room delays as the biggest deterrents to booking more appointments with their vets. Online appointment bookings allows clients to book and manage appointments in real time via the clinic’s web site and Facebook page. Bookings are made directly into the clinic’s schedule in accordance with rules set by the clinic. Panacea achieves this by providing all vet customers with a snippet of HTML code that can be embedded into any web site or Facebook page in minutes. This creates a widget that clients can use to create and managed appointments online. The simplicity of this approach belies the complex technology behind Panacea’s online booking functionality. This technology allows the clinic owner to have full control over who can book appointments online and when and which vets and rooms will be automatically allocated to online bookings. Instead of simply sending an email to the clinic indicating that the client would like to book an appointment (which is all most other systems can currently accomplish), Panacea actually creates the appointment directly in the clinic’s schedule at a time that is convenient to the client and the clinic. Over 95% of computerised vet practices surveyed by Panacea use legacy client/server software that was initially developed in the 1980’s and 1990’s. These legacy client/server applications are expensive, inflexible and difficult to use. They require manual upgrades and on-site support and they can’t be easily be extended to support modern functionality such as online client self-service and advanced analytics. Third party online self-service options are available for many of these legacy products but, as they are separate from the practice management system, they are expensive, complex and hard to maintain. Most clinics simply don’t bother. Because Panacea is cloud-based and delivered over the web, all Panacea customers run the latest version of the application at all times. Updates and bug fixes are released on a regular basis and all Panacea customers have instant access to these. This allows cloud software companies such as Panacea to release advanced functionality, such as online appointment bookings, instantaneously to all customers, irrespective of their location. According to recent studies, over 60% of worldwide software development is now on the cloud and this figure is growing all the time. ‘At Panacea we believe that it’s only a matter of time before all software moves to the cloud. In 10 years time there will be very few legacy (non-cloud) applications left on the market.’ said Funnell. The vet practice management software industry has, thus far, bucked this trend, however. Panacea’s studies show that 95% of computerised practices still use legacy (mainly Windows-based) practice management software that was originally developed in the 1980’s and 1990’s. Also, the rates of practice computerisation are very low in most developing countries and even in some developed countries. Recent estimates, for example, indicate that over 30% of vet practices in the US are not computerised and still rely on paper-based records. Panacea aims to rectify this situation by providing a cloud-based vet practice management system that is as powerful as it is easy to use. Any vet in the world can use Panacea – all they need is a credit card and they can be up and running in minutes. Panacea is currently running a promotion where they are performing a full data migration from any legacy Henry Schein/Provet or IDEX application (including VisionVPM, RxWorks, ImproMed, Cornerstone and other outdated products) to Panacea at no charge. Panacea Cloud Software is the developer behind Panacea, the most advanced vet practice management system available today. At Panacea our mission is to make vets more successful through intelligent cloud-based software that leverages advanced big data technologies. Panacea Cloud Software is based in New Zealand and has customers around the world. Panacea 3.5 – A New Look, Lots of New Tech! Panacea v3.66 is here!